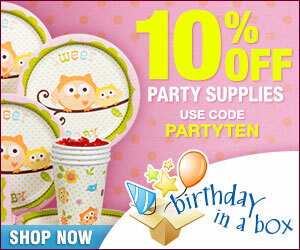 Everyone likes baby showers even if they don’t admit it! It’s a time to socialize with friends, and give mom-to-be best wishes and memories. 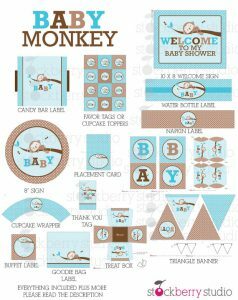 A baby shower monkey theme can be what you are looking for and it’s one of the modern themes out there, and it’s a great unisex theme too. The one type of monkey theme that is getting popular is Sock Monkey. Yes, planning a baby shower can take many hours to prepare, and there are a lot of decisions for the hostess to make along the way. However, at the end, all your efforts will be rewarded and having an overall theme for the baby shower makes your tasks organized. 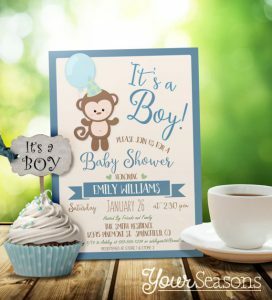 You can buy printable invitations cards and print them out on your computer. These will be personalized for you. Invitations are also available in the bundle packs (which include plates, napkins, etc). Decorate with monkey style! Now, this is the fun part to decorate the venue. If you think about monkeys, you think about palm trees, jungle, bananas, the colors brown/green/orange, curious George, etc.. So base yourself on this and you can decorate your room with the color palette you have chosen. Unisex can have yellow and brown as the primary, for boys blue and brown and for girls pink and brown. You can go wild with all types of decorations. You can buy ready made ones or you can make your own. Some baby shower ideas for DIY are palm trees, bananas on the table with a stuffed monkey animal as a centerpiece. Balloons and streamers are always easy to find and are a great way to decorate your place inexpensively. 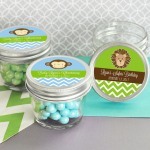 Here is a great package that has everything for a monkey themed baby shower. It can be in pink or blue. 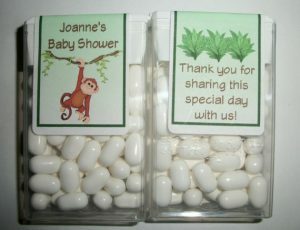 If you are looking for ideas on monkey theme baby shower favors, I have found few for you that can help you put together these little thank you gifts for your guests. First would be bulk Hershey chocolate kisses with monkey stickers that you can purchase here. You can place them in any type of favor bag. Another idea would be mason jars with personalized stickers. These are actually less than $2! You just have to by the candy you like and it makes a perfect little favour. Lastly you can get these pretty labels for TIC TACS. You receive a pack of 28 labels and you stick them on. You can find TIC TACS in bulk here (they are approx. 72cents each). 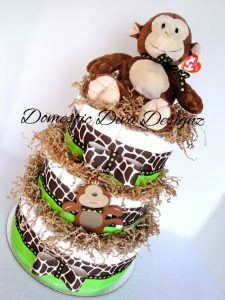 Diaper cakes can be added to your decor as a centerpiece on the main table or even mini diaper cakes on each guest table. And after the party, the mom can keep them as she will need many, many diapers when baby will come! But of course, go with banana cake, or banana splits for dessert. Other foods can be appropriate like Brazilian nuts placed in bowls around the table. You can buy these little plastic monkeys and decorate them on cupcakes or even as party favors. Sandwiches can be cut out in monkey or banana shapes with the help of cookie cutters. 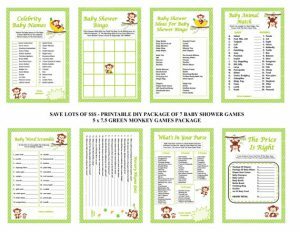 There are tons of games out there for baby showers, but if you are looking for a particular monkey theme game, you can find some that are printable. One you can create yourself is pin on the monkey (instead of donkey). Have a big picture of a monkey and create a banana shape for the pin. Blind fold the guests, and let them pin the banana on the monkey tail! 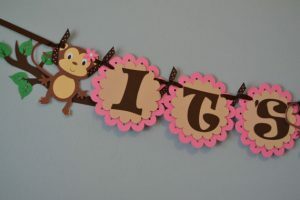 Hope you enjoyed the monkey theme baby shower and can maybe send your creations for everyone to see! This entry was posted in Theme and tagged Boys, Girls, Themes, Unisex. ← Awesome Moon and Star Baby Shower Decorations & Ideas! She likes monkeys so we are thinking to go that way….any other ideas for a coed baby shower? You definitely went all out with the monkey theme. 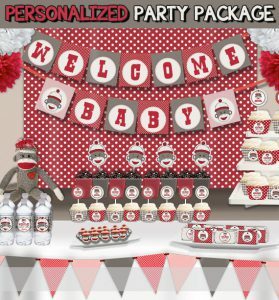 The monkey stickers for the tic tacs, the party kit, and the monkey baby shower games seem fitting to the occasion, great job on this. 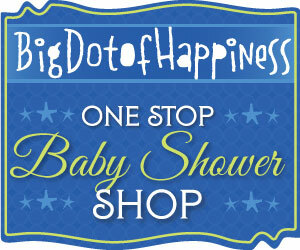 You can check out this post for coed baby shower ideas.